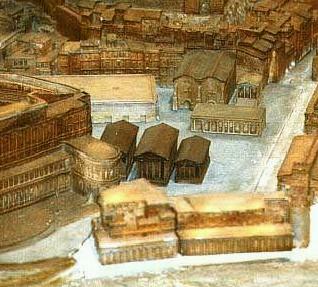 The vegetable market of Rome lying just outside the porta Carmentalis, in the ninth region of Augustus. Its south-east and north-east limits were marked by the Servian wall and the slope of the Capitoline hill, and it extended north-west across the present Piazza Montanara. On the west and south-west it probably extended originally to the river, but was afterwards diminished in area and practically enclosed by four temples, erected in foro holitorio, to PIETAS, JANUS, SPES and JUNO SOSPITA, and the theatre of Marcellus. The ruins of three of these temples exist beneath the church of S. Nicola in Carcere. 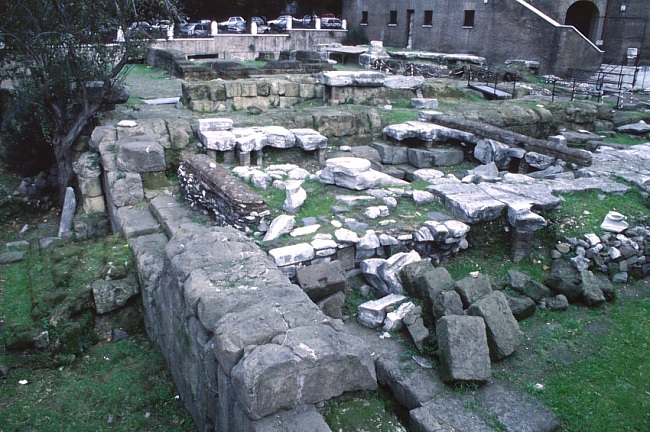 Remains of other Temples lie under and around the Church of Sant'Omobono. Forum Holitoriumtemples under the Church of Sant'Omobono. What's there today -- immediately below the Capitoline Hill -- the arches to the right are the remains of the ancient Porta Carmentalis in the Republican (so-called, Servian)city walls. 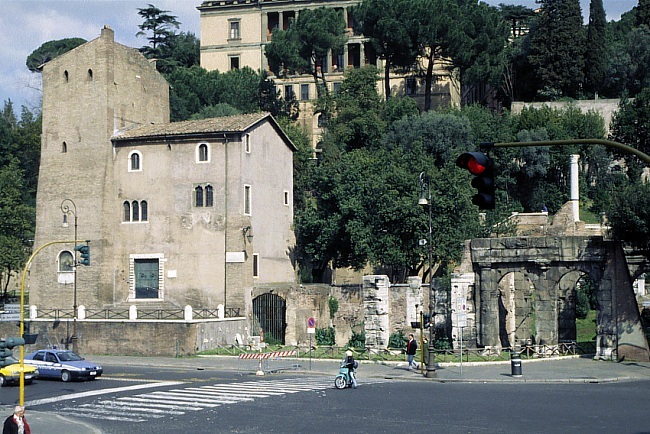 The truncated tower and house behind the fence on the platform, left, are Medieval, and the Palazzo on the Capitoline slope is Renaissance.